The only comment I can give about this movie is - SEE IT. It's one of the most heart wrenching, yet beautiful movies I've ever seen. 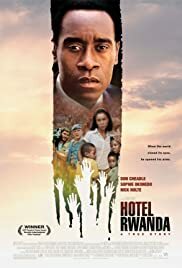 I really hope Don Cheadle and the movie receive Oscars! The acting is superb and the fact this is based upon a true story only makes it better. You may need some Kleenex as I was overwhelmed for a large part of this movie. I had the honor of seeing this movie at a preview screening with the real "Paul" and his wife attending - what an absolute amazing experience to be in their presence. This movie will make you rethink everything about what it means to be human and how much we need to think about all our neighbours in this world. 179 of 210 people found this review helpful. Was this review helpful to you?